When we think about people with cancer, the images that usually come to our minds may be dark and sad. But that is not what Linda McCarthy sees. For her 'Survivors' project, she took pictures of women who survived or are being treated for breast cancer. She says her goal was to put a face on breast cancer. One of the survivors is Cheryl Listman. In 2013, tests showed that she had stage 2-B breast cancer. Listman was told she had a 40 percent chance of survival. Thinking about her two children helped her decide not to give up and to keep fighting the disease. Listman said she liked the idea of the Survivors photography project. "I work with women. I help educate women who are going through the journey and just help them navigate through the medical side of it,” she said. When McCarthy asked to take her picture for the project, Listman thought it might be yet another way to influence other women. It also helped her to look back in time and see how far she had come over the past few years. Linda McCarthy's photo of Cheryl Listman, like the other photographs in the Survivors project, includes a life affirming phrase. 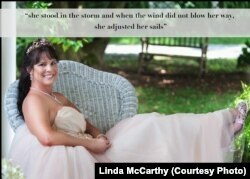 The idea of publicizing breast cancer survivors came to McCarthy when she was searching for a ballerina to photograph. During her search, she met a woman named Maggie, who was known as the bald ballerina. Doctors told Maggie when she was 23 that she had stage-4 metastatic breast cancer. McCarthy asked if she could take her picture – not as a dancer, “but as a beautiful girl who happens to have breast cancer." McCarthy told VOA she has always sought to capture the heart and spirit of her subjects. To do that, McCarthy offered each woman she photographed a chance to meet and talk openly. This gave McCarthy a chance to get to know them. The women were also offered a makeover. They worked with makeup artist Victoria Ronan. "In some cases, it's been a very long time since they have had makeup on. It's been a very long time since they have done something for themselves. … I’ve had a lot of women look in the mirror and just start tearing up because they couldn't believe how beautiful I've made them look." Listman says it is helpful for breast cancer fighters and survivors to feel beautiful. "It's very important because when you go through a horrific journey and treatment, you don't feel beautiful. And there is a lot of things done to your body physically; there is a lot of things done to you emotionally, mentally, things that you will never forget that are not pretty. So, when you get to that point in your journey, you feel like a woman again. You feel beautiful, you feel like, you know, you've accomplished the mission." McCarthy says she hopes that one day she will write a book about her experience capturing survivors in photographs. Faiza Elmasry reported this story for VOANews.com. George Grow adapted her report for Learning English. Ashley Thompson was the editor.